This building was erected in 1935 on the site of an earlier inn of the same name. 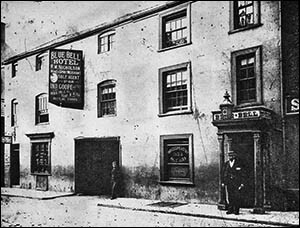 In the 19th century the Blue Bell was the venue for the annual meeting of the Court Leet of the Crown Manor of Nantconwy. This court was described as “ancient” in a document written in 1286! A leet was a geographical area of criminal jurisdiction, often corresponding with the territory of a manor, lordship or hundred. This was subdivided into frankpledges, groups of 10 men who were collectively responsible for the behaviour of each group member. The Court Leet would meet once each year to view records from the frankpledges and punish anyone who had misused Crown property. In 1902, for example, the Court Leet imposed a £5 fine on James Stott of the Oakwood Park Hotel for taking gravel from the Conwy estuary foreshore – ground which still belongs to the Crown today. In the 1890s the press reported that the court had met at the Blue Bell Hotel either for some 200 years or for the last 120 years. This indicates that the Blue Bell existed in the 18th century. In 1827 the licensee was Edward Jones, who passed the baton to Williams Jones c.1860. Robert Williams, licensee in the early 1870s, was also a joiner. Arthur Wildman, licensee 1917-1924, was also a horse dealer. Marathon runner Percy Smallwood (pictured left) was born at the Blue Bell. His dad John was licensee from 1884 to 1896, later running the nearby Black Horse Inn. Percy emigrated to New York in 1903 and won 75 first prizes in 1905 as an amateur middle-distance runner. He then turned professional, winning the 15-mile championship in New York in 1906. While staying a few days in Conwy in 1908, he ran to Penmaenmawr and back in 50 minutes. Cunard Line arranged for him to train by running on the ocean liner’s deck during Atlantic crossings. Robert William Nicholson took on the hotel in 1896 after retiring as head gardener at Bodlondeb, the estate north of the town (now public parkland). His name is on the large sign in the photo of the building (above, right). The hanging sign on the left is for the Public Telephone Office which was located here. The new Blue Bell had a wall-mounted sign depicting a blue bell with the date 1935. The sign was removed when the building was refurbished in 2010 and is now displayed in the beer garden behind. At the far end of the beer garden is one of the towers of Conwy’s 13th-century defensive walls.